Regardless of whether your organization requires complex database architecture design, SharePoint 2019 SQL optimization, shredded storage, custom .NET application back-end data sources development or SQL Server upgrade consulting, EPC Group extensive experience captures all areas of SQL Server including the new In-Memory OLTP engine. EPC Group’s consulting services also includes connectivity to external line-of-business (LOB) data sources as well as working with SharePoint 2019 and the BCS via custom APIs or OAuth. Our Business Intelligence (BI) services around SQL Server provide for expertise around developing custom reports as well as working with SSRS, PerformancePoint, Power BI or for custom BI solutions tailored to meet your exact needs whether on-premises, cloud-based or in a hybrid architecture. With the latest releases of Microsoft SharePoint 2019, SQL Server 2012 R2, Office 365, and Microsoft Office 2013, Microsoft has released a number of powerful tools that comprise the overall Microsoft Business Intelligence stack. 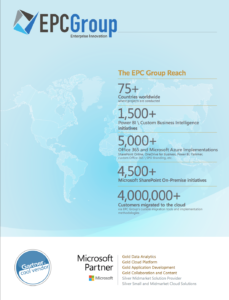 EPC Group has been involved in hundreds of successful initiatives to implement, configure and develop BI solutions around the latest Microsoft BI Stack.